Classic Elite Yarns: Where have all the stitch markers gone? Where have all the stitch markers gone? Stitch markers…they are a knitter’s best friend. They help keep us on track by separating repeats, telling us where to increase or decrease, or even helping us count our stitches when casting on. They come in a variety of shapes and sizes, can be economical (plastic ones that come in a large bag) or luxurious (take a peek at some of the beautiful ones you can find on Etsy) and yet they seem to be the tool we need to replace the most. Sure, they are small. And the rubber ones seem to bounce right off the needles. But it feels like I buy a new set of stitch markers once a week. Okay…that is a little bit of an exaggeration, but you know what I mean, right? When looking for lost stitch markers, I recommend starting by looking in between the cushions of your sofa. There is something romantic about the relationship between the sofa and stitch markers. It kinda reminds me of two love sick teenagers. They MUST be together, no matter the odds or what anyone else thinks. It’s the Romeo and Juliet story of knitting. I am sure that if you were to lift up your sofa cushion today, you would find a bunch. And then there is the vacuum. I don’t know about you, but my vacuum requires that I often give it sacrifices. No, not just the clumps of cat hair and dirt it is supposed to pick up. But also small earrings, hair bands, cat toys and stitch markers. I don’t know how so many get trapped in there. I am lucky that I have one of those newish vacuums that has a bag-less canister that is see through…so I can identify all the things that I didn’t intend to pick up. I confess that I don’t always dig out the stitch markers. I consider it an offering to the powers that be – knitting and vacuuming. Truthfully it’s not worth getting my hands dirty for. Although I did recently see a cable needle on the inside of the canister and just couldn’t let it stay there. But beyond the sofa and the vacuum, where do all of our stitch markers go. Sure, there are probably tons in all of my WIPs. And if I was honest with myself about what was going to get finished and what wasn’t, I could increase my supply (this is also why I know I own about 15 sets of US 4…my favorite size, but that is a whole other blog post). But that still doesn’t answer my question. Where do they go? Are they like the toys in the Toy Story series and come alive when no one can seem them? Do they play together? Do they have support groups for the ones that don’t see as much love? Do they run off, looking for a better life? 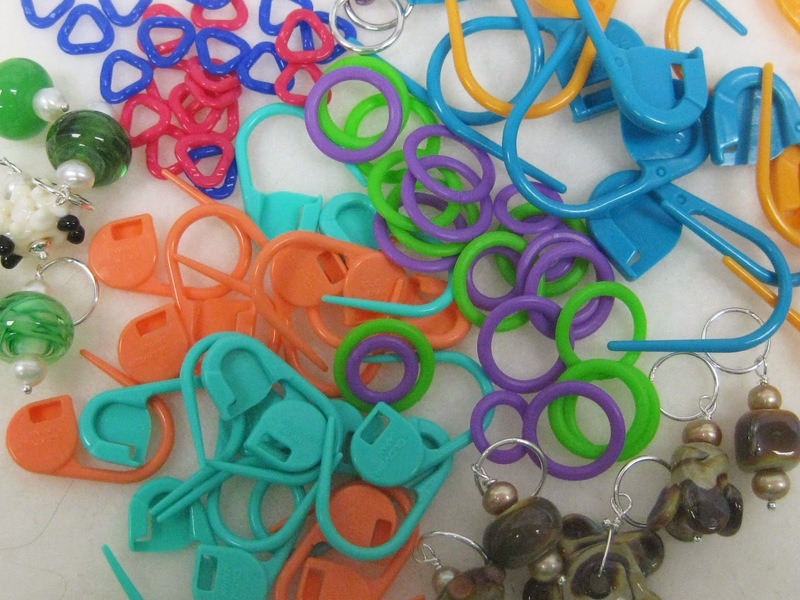 Do you know where all the stitch markers have gone? If so…can you let me know? ...when you need more the shops are out of them or they have trendy funky ones with beads that catch on your work. No idea, but mine must be there somewhere with yours! I seem to buy more every few months. Of course, I must buy the bigger ones I seldom use with the little ones I use (and lose) all the time. I've discovered the tiny rubber bands in the huge batches of rubber bands my husband gets, he doesn't want the little ones! I use colorful jump rings. I get about 100 a pack for just $2 (maybe less if you have a store coupon). Sock manufacturers and stitch marker makers have a secret deal with your couch cushions and your dryers.....we, unknowingly, must feed the beast! Resistance is futile. I will save colored straws from drinks at fast food places or gas stations and snip 1/8 inch or smaller pieces off that and use as stitch markers. They work on needles up to size 9. For any projects larger than that I use yarn pieces that I weave as I go or the plastic "safety pins". I haven't lost any of the "pins" in the vacuum and don't care if the straw pieces get lost or devoured. I use the tiny coloured elastics the kids use for their hair. They are cheap and cheerful and came in a huge package. I leave them on my knitting table in my shop for all the knitters to use in a pinch. 4 is my favourite size too, can never have too many for all those WIPs. I use all of the above for stitchmarkers. I also have a package of those rainbow loom rings for all the colors. What do I use most of all? A contrasting piece of yarn.